We are in Cooperstown to see the Classic at the beginning of the season and are, what psychologists would call “Basking in Reflected Glory”. We received quite a pile of VIP treatment earned by our resident hurler (none of which we earned ourselves). The friendly Hall of Fame Staff and the super polished folks of the Otesaga Resort (even though we weren’t staying there) treated us all exceptionally well…and fed us in serious style after some events. We did manage to try a couple of local haunts. One such shop was tucked into the back of the Silver Fox Gift Shop. First you walk through the rooms of baseball themed merchandise and paraphernalia, then through the room of summer Christmas holly-jolly (?!? 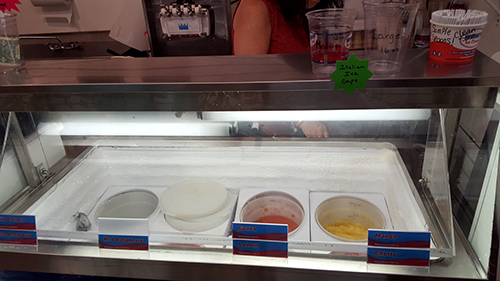 ), there is a little display case of ice cream (they serve Hersheys) and, what we were there for, (I don’t know if this is from Hersheys as well) Italian Ice. Talk about a treat made for a hot and muggy day of baseball. Ever since having my first homemade ice at Johnnie’s Charcoal in Chicago, the intense fruit and citrus flavor resonates in my noggin. I don’t think this was made in house…the shop a few doors down which specializes in the stuff but didn’t have any ready when we were there was pouring some sort of bottled mix into the ice cream machine…but three of the four flavors we tried were stupendous. The cherry, guava and mango were cold sweet versions of archetypal fruit, the flavor you are hoping for when you bite into the actual fruit itself. 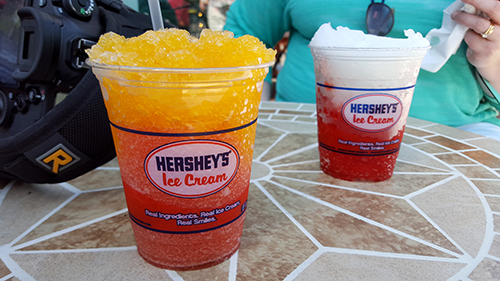 Excellent for a hot summer day. It might be Johnnie’s lemon mix ruined me forever, or the lemon at Silver Fox just isn’t as bright and happy, but it didn’t live up to the other three flavors. 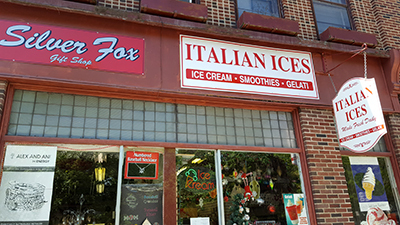 Sure they probably bought a mix, made it cold and scooped it into a cup but the few minutes enjoying them on the sidewalk outside in Cooperstown is a pleasant memory.